Although it’s one of the things that makes us unique as humans, that opposable thumb can really cause problems. Our ability to grip and manipulate things with our hands and fingers keeps us busy at work, at home, and even when we play. All this work and play with the hands gripping or pressing downward can cause repetitive stress injury or overuse injury in the hands and forearms. Instead of heading straight to surgery or medication, to fix the issue, why not deal with the problem at its root – the muscular imbalance between the two sides of the forearm. A recent article quoted below has an easier, less invasive alternative to surgery and medication. The author suggests a combination of stretching and strengthening exercises to overcome issues soreness, pain and stiffness in the hand from overuse injuries. Here’s a little background: all muscles work in pairs. There is the muscle that does the work – the prime mover – and there is the muscle that is its opposer – it’s antagonist. Both muscles work in tandem. As one contracts, the other relaxes to allow movement. This is the mechanism used throughout the body for motion to occur. Muscles form systems of pulleys that work in concert to move your body. The majority of the muscles that move the fingers and the hands actually reside in the forearm. You have a set of muscles referred to as the “flexors” which flex your arm, bringing your palm toward your forearm. The antagonist muscles, “the extensors,” are the muscles which bring the back of your hand toward your forearm. Because the majority of the movements we make during the day deal with gripping, holding or otherwise using the flexors, these muscles become very tight. Over time, hundreds and thousands of strokes on a keyboard or stirring with a spoon, or cleaning up around the house strengthen the flexors to the point that they become chronically tight. Since the muscles work in pairs, the extensor muscles, those on the back of your forearm, get overworked and start to weaken, and no matter how hard they try, the extensors can never catch up to take up the full tension the tight flexors cause. The flexors, meanwhile, keep shortening as they tighten, many times causing dysfunction and/or pain in the forearm, hand, wrist and finger movements. So what do you do? In order to rebalance the muscles so they work together as a healthy pair, you have to do two things: 1) stretch the flexors to extend the muscle and loosen it; and 2) strengthen the extensors so they have the ability to counteract the flexors and keep the muscle tone balanced. 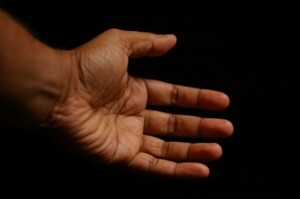 in many of these cases it may be as simple as tailoring a strategy that includes rest from the activity causing the problem, applying ice to reduce inflammation, and rebalancing the relationship between the finger flexors and finger extensors, specifically addressing the muscles involved with extension of the digits. via Conservative Treatment of Repetitive-Stress Injuries: Exercise Is the Key. The solution has two parts: strengthen the extensors and stretch the flexors. Throughout the day, stretch the forearm flexors. Extend your arm and put your hand out in front of you as if you were directing traffic and telling cars to stop. With your other hand pull the fingers and the hand back toward your body. You should feel the stretch in your palm, the inside of your wrist and the forearm. Hold each stretch for 1-2 seconds and repeat it 20 times. Do three sets a few times during the day. Part two, the most important part, is to develop strength in the extensors. Make a loop out of theraband or another stretching material. Stand up and put one foot in the bottom of the loop. Stand with your arm at your side with your palm sort of parallel to the floor (facing downward). Put the top of the loop over the top of your fingers and pull the back of the hand toward the forearm (up toward your head). You should feel the back of your forearm working to pull the stretchy band or rope upward with your fingers. Do these for 1-2 second at a time and repeat 20 times. Do three sets a few times during the day. Remember that the goal here is to strengthen the extensors – the back of the forearm – and to stretch out the flexors – the muscles used to bring the palm toward the forearm. Take the time to rebalance the muscles in the forearm can reduce soreness, achiness, stiffness and other symptoms associated with overuse injuries or repetitive stress injuries. « Warrior Dash: Adult Dream or ER Visit Waiting to Happen?